Hammer using Hitmen, Senators, Governors, and the psyche of a PTSD War Veteran. Adam reviews the surprising new film from Lynne Ramsey, You Were Never Really Here starring Joaquin Phoenix. Lynne Ramsay in a career that has spanned three decades, four films, six shorts, and one music video has never produced a project that wasn’t filled with artful intent and purpose. You Were Never Really Here, the follow up to We Need to Talk about Kevin is as striking, and artful as any of her previous work. The writer/director/producer adapted her script from a novel by Jonathan Ames of the same name that tells the story of PTSD, pain, and mental faculty. The film is a treatise on what violence does to the mind to a person who trades in violence as a commodity. The film begins as Joe (Joaquin Phoenix) has finished his latest job. A former soldier that now retrieves missing girls and dispatches their captors. Before one has visions of Liam Neeson’s “certain set of skills”, Ramsay is not making that type of film. Joe is a literal and figurative hammer. As blunt an instrument as Joe is, he is not indestructible, we see the cracks in his armor very quickly. At turns, Joe is delicate almost fragile, sensitive to his ailing mother. At other times he is almost harshly dogmatic, an ongoing running dialog to himself directed at a father long ago deceased. You Were Never Really Here unfolds slowly, like the unraveling of Joe’s psyche. Ramsay uses an almost languid pace as a counterpoint to what would normally be a taunt exploitative story. In her hands, it’s deceptively simple story of a man’s decline into madness and paranoia. Using sound, editing, and visuals the director finds a subtle subjective way to allow an audience into Joe’s world. This is not a world of hitmen doing gun-kata, rather a harsh environment of death, remorse, and almost blinding paranoia. Joe retrieves these young girls and kills their exploiters not out of some sense of civic duty but to give him a reprieve from his violent urges and episodes. Joe in the hands of Joaquin Phoenix is as perfect a physical and emotional performance we will see this year. For the role, the actor has covered himself in scars and extra weight behind muscle making Joe a feral blunt instrument of death. Phoenix though muscular isn’t sculpted, chiseled marble as some may have gone. Joe isn’t a lean stylish killer, he is scary in a real way. Both actor and director seem to want to side on the verisimilitude than the hitmen of Jean Pierre Melville and John Woo. They are attuned to the damage that has been done to Joe in his past and the self-induced torture of his present. The character hardly flinches when someone attacks him physically, only responds in kind with violence devoid of any anger. However, trespasses to his character or his emotions like having to wait are reciprocated with emotionally charged outbursts of violence. Joe is a raw nerve unable to let go of the past, live in the present, or look to the future. The film though plot-driven, it is neither an action film nor the kind of performative exercises that Ramsay’s peers have created in this sub-genre. You Were Never Really Here is a character study of a man of violence and the decay that has caused to his mind, body, and soul. Ramsay who wrote, directed and produced the film has pushed this material beyond the conventional trappings and clichés to something more artful, less defined. 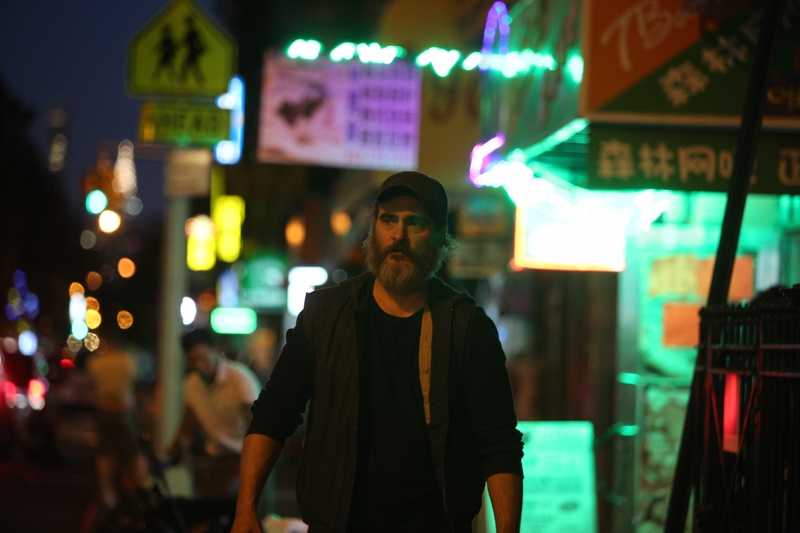 By its end You Were Never Really Here will leave one with more questions than answers. In any other director’s hands, this would be a critique. This is not only a compliment but a virtue in Lynne Ramsay’s hands. The film wants to provoke and confound, to cause a reaction, to have more questions than answers. In our homogeneous times of four-quadrant entertainment this film stands proudly apart as defiant art. You Were Never Really Here is in theaters in LA/NY on April 6th and Nationwide on April 20th.